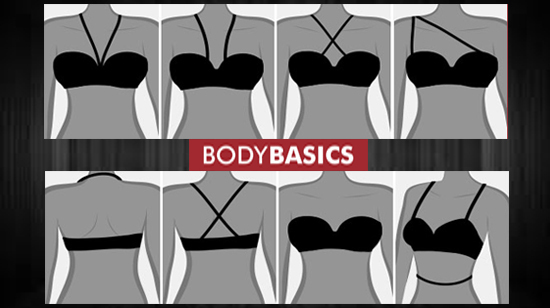 BODY BASICS | Lingerie | Inner wear | Accessories | Sports: MULTIWAY BRA – A MUST HAVE FOR EVERY WOMAN'S LINGERIE COLLECTION !! MULTIWAY BRA – A MUST HAVE FOR EVERY WOMAN'S LINGERIE COLLECTION !! Multiway bras, as the name suggests, allows you to change the position of the straps to suit different outfits, including strapless , halterneck, racer back, one shouldered, cross back or even the conventional style. Hence it is also known as “Convertible bras”. The Multiway bra provides support as well as comfort and is a must have for every women’s lingerie collection. Infact a convertible bra is an ideal investment and a perfect bra for every occassion. While buying it remember that every convertible bra should be able to do a classic bra shape, halter neck and crossover back. Not all can go strapless or low back. To make it strapless it will need to have cups that aren’t peaked at the top and are firm so they can stay up without the straps. For many women, the thought of wearing a multi-way bra strikes fear into their hearts – after all, without those supportive straps in place, what’s going to be holding your bust in place? However, multiway bras are an essential part of any woman’s lingerie wardrobe, so have no fear.The support in a good bra should predominantly come from the underband, not from the straps. The straps are in place to balance your bust and help keep the bra as a whole in place; support for your breasts actually comes from a well-fitting underband. The most important thing is to make sure you’re wearing the correct size bra. In case of any doubts, consult a fit expert to ensure that you buy the correct size and style to meet your requirement. So go ahead and wear those outfits which were cornered in your wardrobe for want of a proper bra. Feel comfortable going strapless or simply remove one strap from your multiway bra and voila, you’re all set for the occasion.